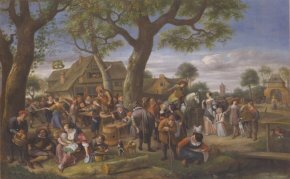 Village fairs, carnivals, banquets, weddings, religious festivals... An unbridled joy is on display at the Frans Hals Museum currently exhibiting some forty-five paintings of the Dutch Golden Age on the theme of celebrating dear to Jan Steen and, notably the Haarlem School. Obviously, an air of debauch adds a sense of piquant to most of the images ; indeed, the world of peasants and pagan festivals was more attractive to genre painters than the universe of high society or religious celebrations. But more than just the illustration of excess often rising from these festivities, they also mirror a social event, which gives the participants the feeling of belonging to a group - a village, an elite, a religious group or a professional trade. The spectator is warmly welcomed to join in, thanks to compositions with, quite often, a low perspective so as to enter the scene more easily and take part in the conviviality, perhaps licence as well. 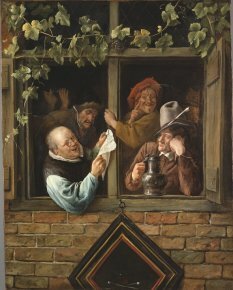 The visit opens with village festivals, a subject found as far back as the late 16th century and the perfect occasion for representing the body in its sometimes comic and joyous facets. 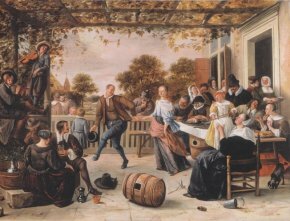 Jan Steen for example illustrates a man trying out some lively steps while inviting a young woman to dance (ill. 1) ; the painting, from a private collection and thus, rarely seen in public, is comparable to a version at the National Gallery in Washington. The city dwellers emerge progressively amid the rejoicing villagers, their elegant and formal presence in humorous contrast, particularly at fairs which provide even more spirited details. David Vinckboons (circa 1608) and, once again, Jan Steen (circa 1676) delight in their descriptions ; The Fair at Warmond (ill. 2) is centered around a group of musicians leading the dancers ; in the middle, a man with his back turned, well dressed, holds out a - lustful ? -hand to a young girl, while the two dogs at his feet may very well be conjuring up for us his base intentions. In the foreground, a woman is urinating shamelessly while an old man looks on snickering ; this allusion to Rembrandt was later altered by a prudish owner who added a jug in her hands, in order to justify her crouching position by a stream. 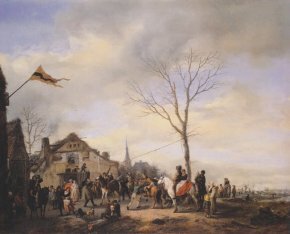 Philips Wouwerman’s skill at painting horses and genre scenes, also landscapes, are all found in one canvas (circa 1652-1653) illustrating the game of herring, played on Ash Wednesday, that is at the beginning of the Lenten fast (ill. 3). Two horsemen attempt to catch the herring hanging from a string, while on the sideline the other players await their turn ; among them, a horse overthrows the rider showing only his legs and red socks. 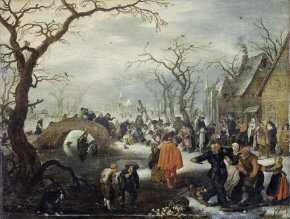 Weddings are another festival involving all of the village people, but wedding celebrations among the higher classes are much rarer ; still, there is a painting by Anthonie Palamedesz, discovered later in a private collection and which therefore does not appear in the catalogue, illustrating this very subject). 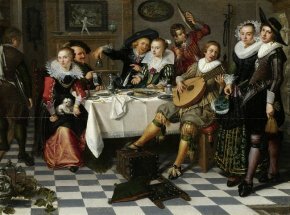 Both a portrait and a genre scene, it depicts a more intimate, less exuberant wedding reception, yet more affected also than the peasant gatherings. After the fairs and the frolicsome crowds, the exhibition studies the theme of gallantry, that is the pastimes of the haute bourgeoisie and the aristocracy, with music playing and revelling. 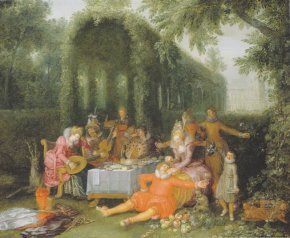 This subject developed in the 17th century and David Vinckboons made it his specialty ; placing his figures in garden settings, he sometimes slipped in an allegory of the five senses and makes the spectator an incarnation of the Sight (ill. 4). 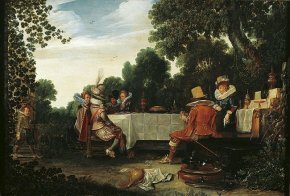 The representation of elegant and joyful reunions prospered in Haarlem at the beginning of the Golden Age, thanks to painters such as Willem Buytewech, Esaias van de Velde and Dirck Hals. Van de Velde invites the spectator to silent feasts, ornates the tables with silver pieces surrounded with wise looking figures, some with their backs turned, and who, bedecked with a feather and pleated coat are colorful indeed (ill. 5). Little is known about Isaac Elias who produced a very beautiful gathering of young people around a festive table (ill. 6). According to Jasper Hillegers , the artist was inspired by 16th century engravings of Dirck Barendsz and Gerrit Pietersz Sweelinck who illustrated scenes of the world before the Deluge or the Last Judgement, and introduced a painting within a painting : on the wall we can see works which Jasper Hillegers identifies correctly as The Deluge and The Battle of the Israelites against the Moabites by Antonio Tempesta. An engaged couple are standing on the right, distancing themselves from the carousing, symbolizing their choice of a peaceful life far from the partying singles crowd. These scenes of merrymaking do not all affirm a moralizing message however, and seek above all simply to please and make us smile. We then discover costumed celebrations, the first being carnivals, which are the most permissive for those seeking to cut loose. Adriaen Pietersz van de Venne painted a winter landscape depicting a strange sort of Mardi Gras procession crossing a bridge (ill. 7). A woman who has fallen down exposes her buttocks, under the bridge a man is relieving himself, as is the dog behind him ; a peasant is decked out in a dress and a woman is wearing a man’s coat. In the foreground, two men are fighting it out, knives in hand over the broken eggs on the ground which seem to illustrate the proverbial warning of "never put your eggs in the same basket." At the center of the picture, an elegant couple observe the scene. There are other traditional occasions to play dress up ; The Mascarade of Valentin and Orson painted by Horatius (?) Bollinger (ill. 8) and inspired by a work of Pieter Brueghel the Elder, was a popular game taken from a novel of chivalry with a scene including a woman wearing a ring, a king, a cross-bowman and a savage. The twin brothers, Valentin and Orson, were abandoned in a forest when they were small. The first was raised at the court of Pepin the Hunchback, the second grew up in a bear cave and became a savage before being discovered by Valentin who took him on as his servant and companion. Another character parading during these mascarades is the Queen of May represented by Jan Steen, generally embodied by a pretty girl wearing a crown of flowers who goes through the village asking for a few coins. Another queen, Mary Stuart, was depicted by Adrieaen Hanneman, around 1664, on the feast of the Epiphany, 6 January 1656 which she organized in The Hague ; she is seen wearing a feathered costume, its exotic splendor underscored by the presence of her black servant. This feast day as well as Saint Nicholas Day are very popular religious celebrations which Jan Steen and Richard Brakenburghn illustrate in joyous interior scenes (ill. 9). 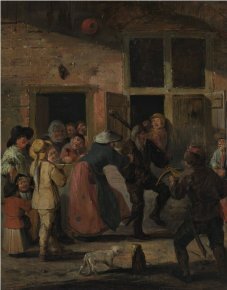 Paintings of nocturnal revelries are not as frequent, notably those related to the end of the Eighty Years’ War or the Dutch War of Independence in 1648, except in the case of Egbert van der Poel who saw it as an occasion to paint the effects of a torch lit scene. Other typically Dutch subjects icnlude : the rhetorical halls and oratory contests which drew crowds. The exhibition presents the coats of arms of these different societies, while an anonymous panel tells of the competition organized in July 1616 with a highly colorful procession of orators, each representing a different character. 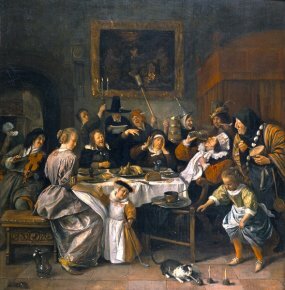 Jan Steen, in his case, looks at the eloquence of intoxication (ill. 10). The exhibition closes with a flourish, the famous portraits of officers of the civil guards. These are no longer stereotyped revelers, but known individuals, grouped together in a festive portrait around a banquet table. 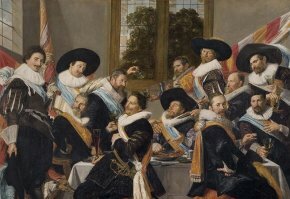 Van Haarlem painted them in a vivid manner, but Frans Hals surpassed him and renewed the formula of collective portraits by seizing the characters, gestures, features and expressions of these officers (ill. 11) who caroused for long periods and were a source of controversy at the time, to the point that the authorities finally limited the occasion to a maximum of four days. This gives us an idea of just how far they went in their merrymaking. The catalogue, including entries but no index, nor any historical background for each painting, offers analyses of costumes, postures and dance steps, behaviorial studies as well, perceived as decent or not by society at that time. After leaving the exhibition, visitors innocently curious to discover the rest of the museum will be astonished to see works by the contemporary painter John Currin mixed in with the permanent collections in an effort to establish an artistic exchange with the canvases of Cornelis van Haarlem, offering notably some Sapphic images in a display of flesh which, alas, suggest very little in the way of associations. No doubt, after the licentiousness of Golden Age feasting, this is an attempt to study the notion of what is shocking to spectators in the 21st century by pushing the limits of decency a step further. Unfortunately, provocation has never turned an artist into a genius. It is only when he is already a genius that he can then allow himself to provoke, a fact often forgotten by some of today’s creative masters. Under the supervision of Anna Tummers, Celebrating in the Golden Age, NAi Publishers 2011, 160 p., 27.50€. ISBN : 9789056628352. Visitor information : Frans Hals Museum, Groot Heiligland 62, Haarlem. Tel : +31 (0) 23 511 57 75. Open from Tuesday to Saturday from 11 am to 5 pm, Sundays from 12 pm to 5 pm. Tickets : 10€ (reduced : 4.40€).